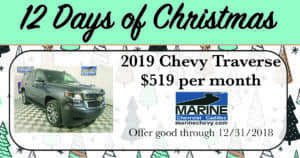 On the first day of Christmas, Marine Chevy gave to me…. A free nitrogen package voucher for you to keep or to give away as a gift when you purchase a wheel alignment, see the Service Department for more details. 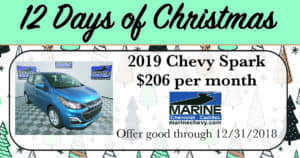 Offer good December 10, 2018 only! A free decorative tow hitch cover to keep or to gift with any transfer or differential service. Offer available on December 11, 2018 only. Free mount and balance with purchase of four tires. Offer available December 12, 2018 only. Free Classic Car Wash Gift Certificate to keep or gift, with any purchase over $99. Offer available December 13, 2018 only. Free iPhone Wireless Receiver Protective Case, to keep or gift, with any $150 purchase. Offer available December 14, 2018 only. Buy one get one free, to keep or gift, with the purchase of any BG oil change. A gift certificate with you purchase of $50 or more. The more you spend, the more your gift certificate will be worth! Spend $50 get a $10 gift certificate. Spend $100 get a $25 gift certificate. Spend $150 get a $45 gift certificate. Spend $175 get a $50 gift certificate. Offer good December 17 .2018 only. A free upgrade to your detail purchase! Purchase a Classic Car Wash and get upgraded to a Bronze Car Wash for free! Upgrade applies to all levels of detail packages, December 18, 2018 only. 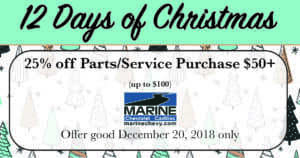 Spend $150 in the parts and service and get a $75 gift certificate to spend on accessories, tint or Toff Spray in Bed Liner, a great gift to keep or to give away! 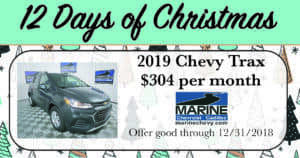 Offer good on December 19, 2018 only. 25% off your parts and service visit, up to $100! Offer good December 20, 2018 only. 50% off a BG Best Oil Service! Offer good December 22, 2018 only. 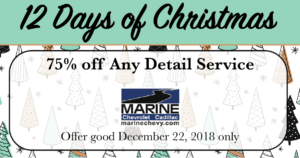 75% off ANY detail service!! 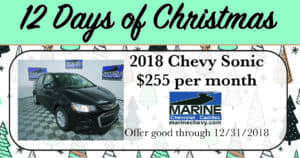 Offer good December 22, 2018 only.